Ingo Venzke came to the IILJ while completing his PhD “On Words and Deeds: How the Practice of Legal Interpretation Develops International Norms” at the University of Frankfurt under the supervision of Armin von Bogdandy. His thesis builds on considerations of semantic pragmatism and it elucidates the agency of international actors in processes of communicative lawmaking. During his time at NYU he focused on the power of international courts, on how their authority can be justified, and on how it may be dealt with in the interaction between different levels of governance. Previously, Ingo was a research Fellow at the Max Planck Institute for Comparative Public Law and International Law in Heidelberg and a Visiting Scholar at Tel Aviv University. He holds a LL.M. with distinction from the University of London (SOAS) and a B.A. in International Relations from the School of International Studies in Dresden. The German Academic Exchange Service supported Ingo’s post-doctoral research. 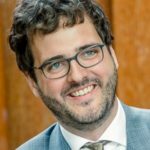 Ingo Venzke is now an Associate Professor at the Department of International and European Law at the Universty of Amsterdam.